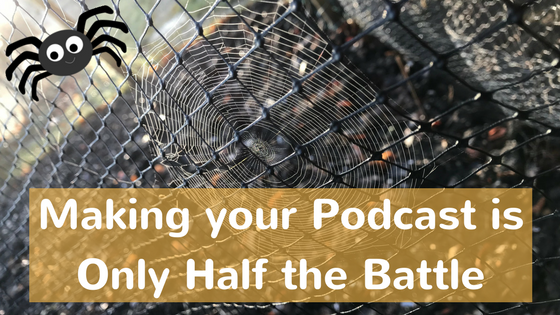 Much like the spider creating his web, we spend a lot of time and effort when weaving together a podcast. We have been improving and learning since episode one. Learning the trade and improving our skills. So much time, effort and sometimes blood, sweat and tears goes into creating our podcasts… So the last thing I want to be telling you is…. There are more than 500,000 podcasts in Apple Podcasts and so organic discoverability has never been more difficult. Whilst I hate to be the bearer of bad news, you will need to find some marketing techniques that work for you and invest a good amount of time into them… This doesn’t mean your podcast won’t work though! The spider spends on average just over an hour to spin a web. Think of this as creating your podcast. The spider will have positioned its web in a specific place, it is not just a home.. but is the method by which it catches its prey. Making sure your podcast is in the right places for listeners is super important. Not just making sure it is distributed to all the right places for your audience (Apple Podcasts, TuneIn, Spotify etc)… But also ensuring that you are promoting your show in the right places, around the right people. Facebook likes video, so you will need to use video to promote on this platform. LinkedIn loves engagement, therefore you will need to inspire conversations to utilise this social surrounding. The final string to a spiders bow… Patience! Spidey will spend a long time weaving the web, using the surroundings, positioning well, however he knows this doesn’t mean he will instantly get his dinner! Podcasts are not an overnight success, however they will get you long term fans like no other medium! Join our FREE 3 Part Podcasting Webinar to learn about Planning, Building and Growing Your Podcast. Claim Your Spot Here. Ich bin selbst begeisterte Podcast-Hörerin und so hat es nur mehr als ein Jahr des hin und her Überlegens gebraucht, bis ich endlich heute an dem Punkt angelangt bin, euch die ersten Episoden meines eigenen Podcasts präsentieren zu können! 😀 In dem Podcast wird es natürlich um lesbische Themen, Coming-in und Coming-out und Lesben in den Medien gehen.